floating panel with feedback and other. No limited to the number of menus and menu items. The current version of the plugin has 1480 Font Awesome Icon. Can be positioned at right or left side of the screen. Opening link in new window. Set the custom size for texts and icons. You can specify for which devices to show the menu. Add custom values to attributes such as CLASS and ID to each menu item. Add your own icon for the menu item. Set the radius, width and color for items borders. Font style and weight settings for the item text. Create a smooth scrolling effect to the page anchors. Create a button that will take the user to the top of the page when clicked on. 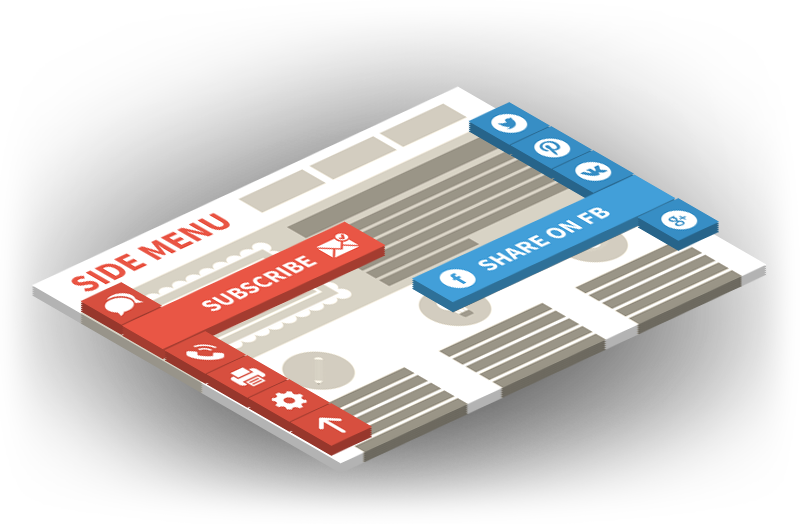 20 Easy Social Share Buttons for WordPress. Function for print the page via a click on the item. Enter the specifics links as Email and Telephone. Hold the Item Open when the page loaded. Show menu depending on language. Show menu depending on user (for all users, only for logged-in users, only for not logged-in users). Show the menu on the specific pages. We work closely with the user community and listen to your opinion. We provide free technical and information support for customers. Product get maintained with improvements and bug fixes.